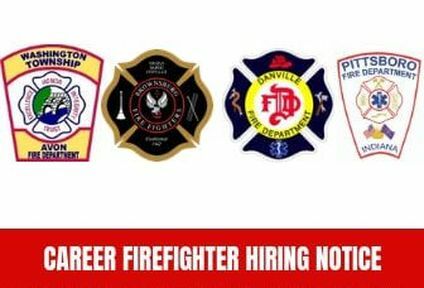 The Washington Township/Avon, Brownsburg, Danville, and Pittsboro Fire Departments and Territories are now accepting online applications for the position of Career Firefighter, with Paramedic preferred. Applicants for the position must possess a current EMT certification. Firefighter Certifications and Paramedic license will be preferred. In addition, all applicants must be United States Citizens, twenty-one years of age, have a high school diploma or equivalent, a valid driver's license and meet the additional specific requirements set forth by the individual fire department merit and pension statutes. Online applications will be available by CLICKING HERE and can be submitted from October 15th - November 9th, 2018. Payments can be made by cash, personal check, or money order. If paying by cash, there will be NO CHANGE given. Be sure to have the EXACT amount needed.